Very Good. Exactly as seen in the pictures. Please read details below. Model: DC41. It is best to recline the vacuum to move it when using the vacuum on carpet. We have seen this on a number of DC41s that we have serviced, so it seems to be a feature of this vacuum model as opposed to a defect. Cleaning your home is no more a hassle with the Dyson DC41 Animal upright cleaner at your command. Featuring a Radial Root Cyclone technology, this Dyson vacuum cleaner generates strong suction power and removes the toughest of dust. Moreover, this upright cleaner can be smoothly steered around the house, as it moves on the Ball technology. With a 0.55 gallons dust capacity, the Dyson DC41 Animal lets you clean at a stretch and saves you the trouble of emptying the waste every now and then. What’s more, weighing only 17.4lbs, this Dyson vacuum cleaner is lightweight and can be carried around with ease. Good Vaccuum, definite upgrade from my previous model, but has drawbacks. 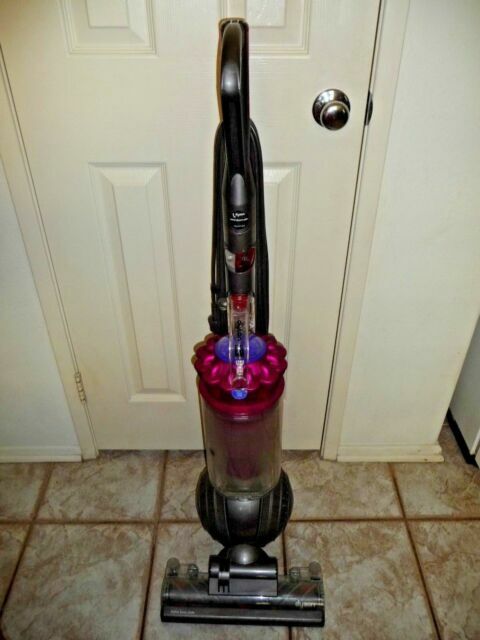 Recommended this vaccuum to my friends - turned out they already owned one! Everything you seen advertised about it is true. Easy to use; deep cleans; lightweight and navigates easily; handy tools; easy to empty and the filters will be a cinch to clean. It is still very new and I do find the extention hosing very stiff on the wand - I struggle with keeping it extended while using hand tools. I see this resolving with time. Wonderful price. After Christmas store prices nearly $200.00 more for the same model, and ours was factory sealed with warranty included.